WHAT IS THE REALMS AT WAR? 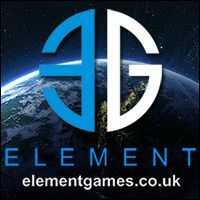 The brainchild of EATMingsFoote (a group of hobby-oriented awesome chaps looking to promote Narrative play in the Age of Sigmar), Realms at War will be the name behind unique narrative events in the UK for years to come. Our first event RAW: Legends 2016 focuses on Aspirants growing in fame and strength over the course of weekend, looking to achieve Legendary status over six scenarios of varying size. 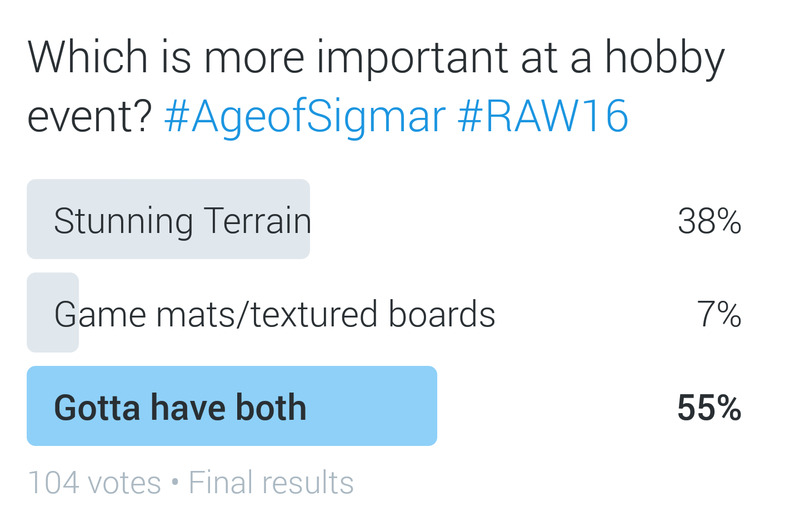 It will be a hobby oriented event, where awesome armies get to play over lovely battlefields (no neon green boards!) and we're already sold out, with the player list looking to be a bunch of truly amazing hobbyists. We'll be using this site to post updates, teasers and anything related to RAW events. 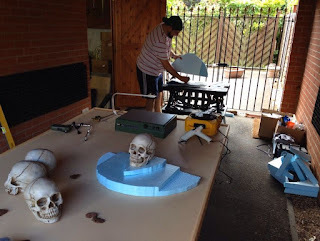 We may even feature our personal hobby progress! For Realms at War: Legends 2016, we had decided early on to theme groups of tables to correspond to a specific Realm, complete with their Times of War rules (one for another post down the line) and thematic terrain to go with it. 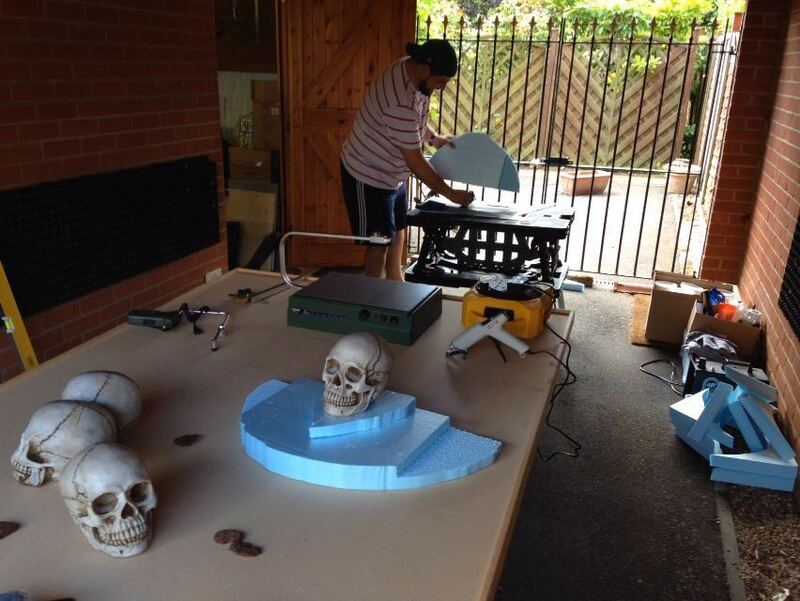 We were inspired by Holy Wars GT's mind-blowing tables and knew we had to do something in a similar vein. 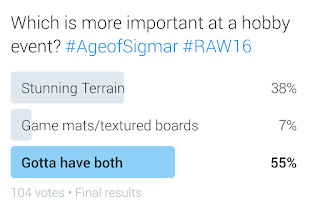 The above twitter poll pretty much said terrain was super important, and thankfully we've already begun work on the tables. First of all, we had 20 tables, divided into 5 banks of 4 tables, i.e. 5 Realms to choose from. Azyr, being Sigmar's stronghold and thus not a particularly exciting or suitable realm story wise, was the first to get axed, much to Ming's delight. The other two was based on what we physically put vision to reality just yet - Chamon, with its molten and everchanging landscape of metal, and similarly the complex symbolism and shapes found in Hysh meant we finally settled on Aqshy, Ghyran, Ghur, Shyish and Ulgu. Shyish would be a particularly special choice, as it'll feature part of the Endless Deserts! 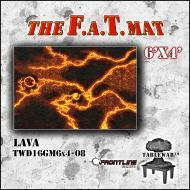 With the 5 Realms chosen, we first pooled together our collective terrain, listed out the various gaming mats we owned, were sponsored (big thank you to Gamemat.eu, DeepCutStudio and Frontline Gaming) and those that we purchased specifically for the event. 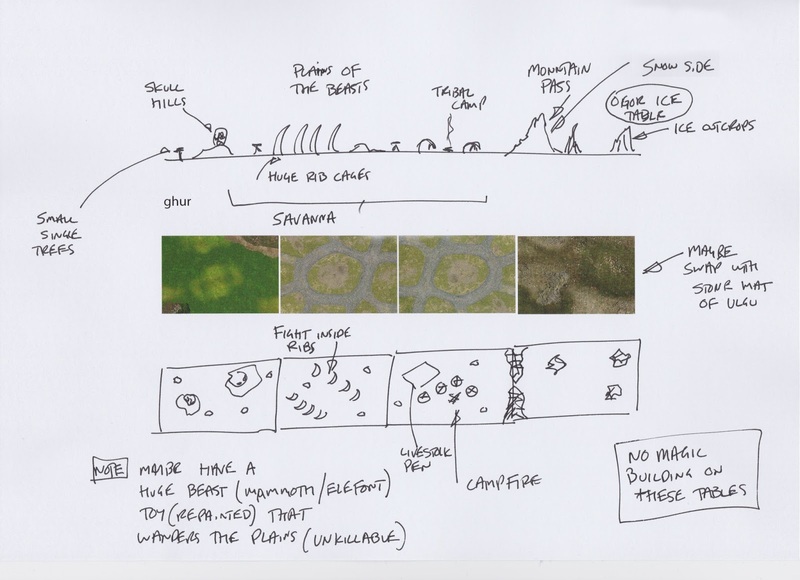 Then the magic that is Steve Foote came up with sketches of how the tables would look like. A huge driver for the design was our desire to have all tables blend into one another as though they were part of the same region, rather than disparate battlefields or identikits of one another. A Skype call later, to discuss what could and can't be done for this event. 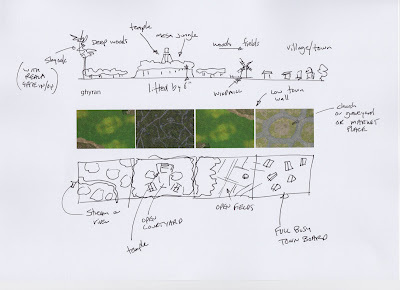 In some of the sketches, there were some really out-there ideas, which we hope to incorporate at some point in the future, but in some cases, we had to simplify for practical reasons. Then comes the "fun" bit; we clearly didn't have all the pieces required and a lot of it would have to be built from scratch. Terrain in AoS differs significantly from WHFB, where terrain used to be more practical and less outlandish, so we felt now's the time to make truly lovely pieces. This task was lapped up by Mitzy and Jimbo, who met up for some terrain building sessions. 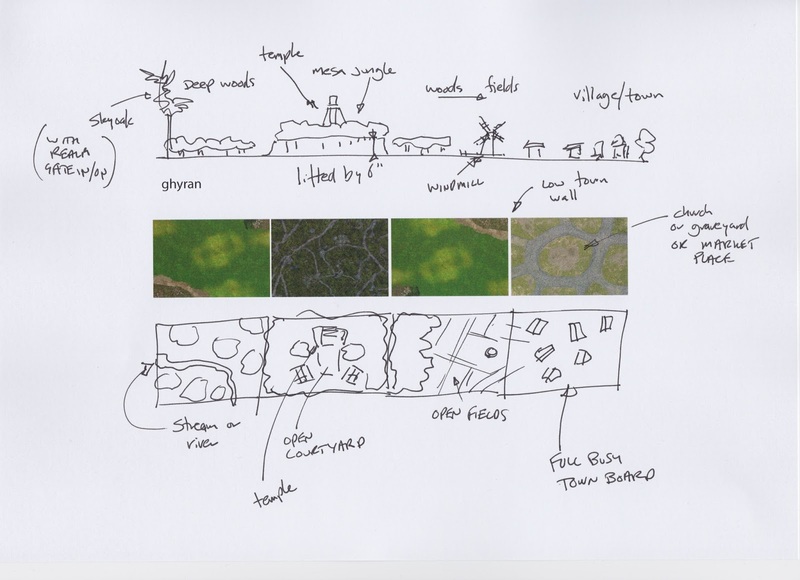 So, will the final finished products match the sketches and our vision? 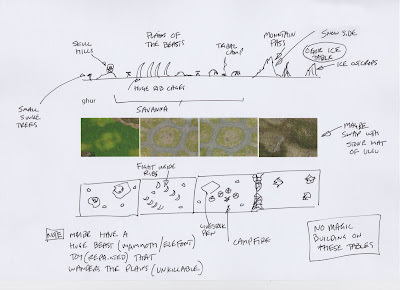 Will you get to see the sketches for the other realms? Well, you'd have to wait and find out when we post Part 2!